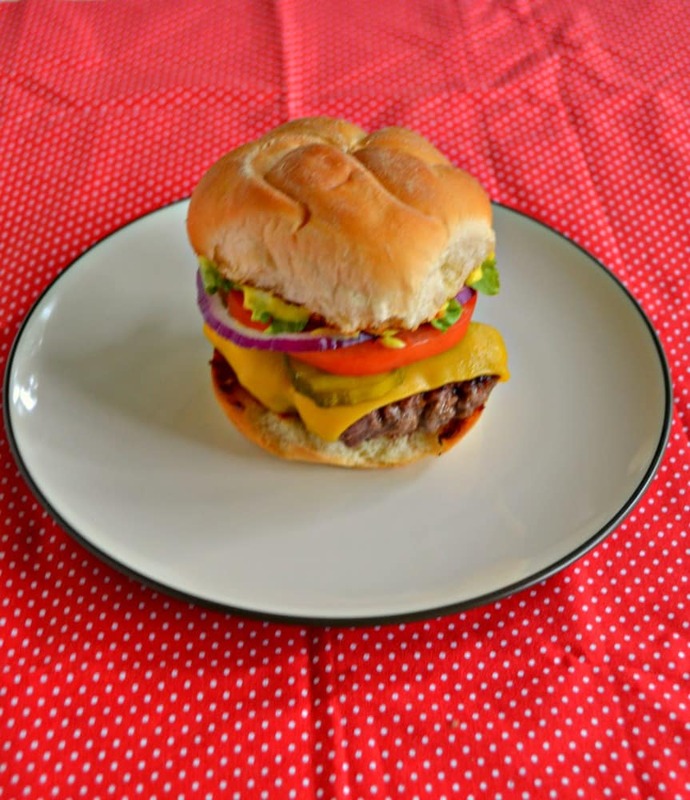 Today is National Hamburger Day and I’m hosting a group of bloggers who are sharing some delicious burger recipes! I actually had a hard time coming up with a burger for this event. Initially I had a ton of great ideas but the closer the date came the harder it was for me to nail down an idea. So when I got my Food Network Magazine on Saturday I was happy to see that they had 5 awesome burger recipes! The recipe I chose was a Copycat Smashburger. It’s funny that I picked this burger because I’ve never actually had a Smashburger. There just aren’t any close to me. In fact, the closest one is about 2 hours away. Smashburger is a restaurant chain that was founded in 2007 in Denver. So what is a Smashburger? I knew the answer to this one because I’ve seen a few TV shows that have recreated this burger. The burger is made by putting a ball of ground beef in a buttered skillet and then smashing it down flat. 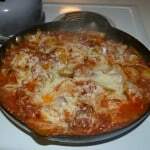 After it’s cooked cheese is placed on top along with other tasty toppings. I wasn’t sure about the sauce that went on the bun. It’s a simple combination of mustard, mayonnaise, and pickle brine. While I love mustard on my burgers, I am not a mayo person. 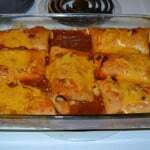 But since I was making this as a copycat recipe I made the sauce and actually really enjoyed it! 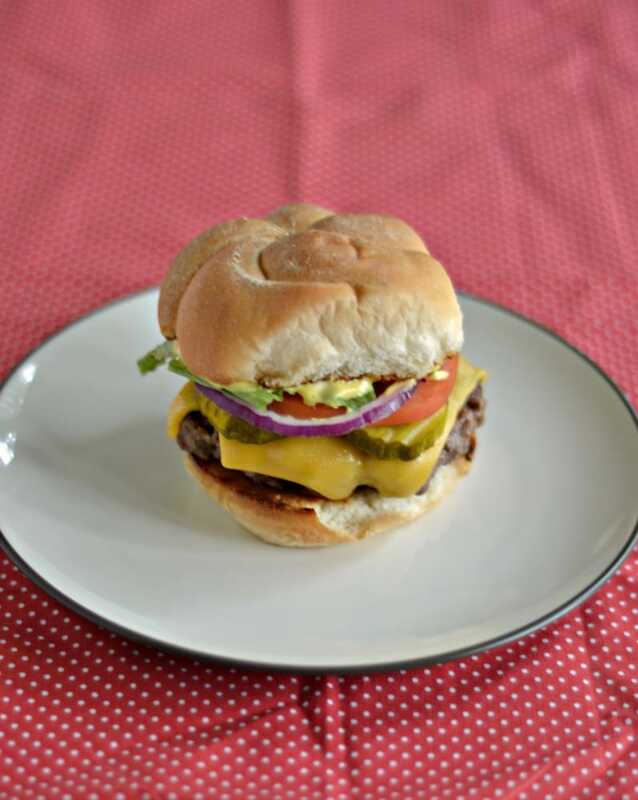 It turned out to be a tangy, creamy type mustard that went really well with this burger. I like how the butter on the burger gives it a nice crust. It had good seasoning and was really easy to make. Then I loaded it up with tomatoes, red onions, and lettuce, and I was ready for a taste. This burger is super tasty! I had a hard time getting it in my mouth because it was huge but the flavors were great. The burger really shined through, the mustard sauce was perfect with the vegetables, and the vegetables added a nice color and crunch. This is a great burger to serve for National Hamburger Day or anytime you are in the mood for a Smashburger. It’s easy to make, it’s colorful, and it tastes good. What more could you ask for in a burger? 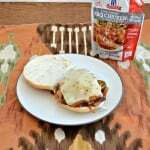 A delicious copycat version of the Smashburger, a hamburger flattened on top of butter then piled high with vegetable toppings and a tasty mustard sauce. In a small bowl combine the mayonnaise, yellow mustard, and pickle brine. Mix well and set aside. In another small bowl combine the onion powder, garlic powder, paprika, salt, and pepper. Set aside. In a large bowl combine the ground beef and Worcestershire sauce. Mix well and divide into 4 large balls. Place 1 tablespoon of butter in a large skillet over medium high heat. Allow the butter to melt. Place the cut Kaiser rolls cut side down in the skillet and cook for 2-3 minutes or until they are lightly browned. Remove from pan and place on a plate. Place 1 tablespoon of butter in a large skillet over medium high heat. Add one ball of ground beef to the pan and press down firmly with 2 large crisscrossed metal spatulas for 10 seconds. Remove the spatulas and sprinkle the beef patty with the onion and garlic powder mixture. Allow to cook for 2 minutes then flip. (At this point begin cooking a second burger patty). Sprinkle the other side with the seasoning mix and top with a slice of cheese. Cook for an additional 1-2 minutes. Remove from skillet and keep warm. Repeat with the remaining tablespoon of butter and remaining 2 balls of ground beef. To serve spread the mustard mixture on the bun tops. 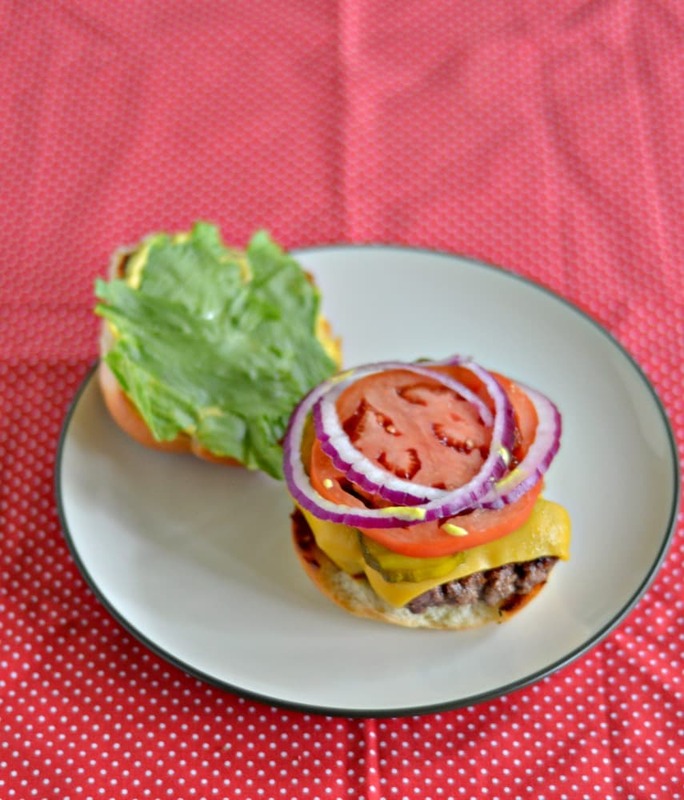 Place the burger patties on the bottom buns and top with pickles, tomato, red onions, and lettuce. Top with the bun tops and serve. Recipe slightly adapted from Food Network Magazine, June 2017, p. 155. No Smashburgers in NH either! And I just happen to have pickle brine in my fridge waiting to be used in something delicious! What a fun event and that is a really great looking smashed burger! Yes! Finally a chain that we have here in Calgary! I haven’t tried it yet, but I’m sensing a taste test coming soon for me! Your burger looks delicious! 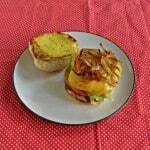 I’ve never had a real smashburger but I have actually made them at home, and they are delicious! Thank you so much for hosting this great event! Wow – your Smashburger looks amazing! Somehow when I signed up for this event I didn’t catch that there was another Smashburger in the mix – had I seen it I never would have entered mine but ours are so different! I love your sauce (I’m a sucker for sauces) and your method works so well indoors. Thank you! I agree, our Smashburgers are really different and even use different methods so it’s all good!